Last week I tried to publish an overview of my research as an interactive outline. This does not work as well as it should. To be honest, it’s almost impossible to use: It’s hard to see connections, it’s hard to spot the complex areas, it’s hard to see patterns. Hanneke Briër, one of my teachers rightly asked me to make a visual version of this map. 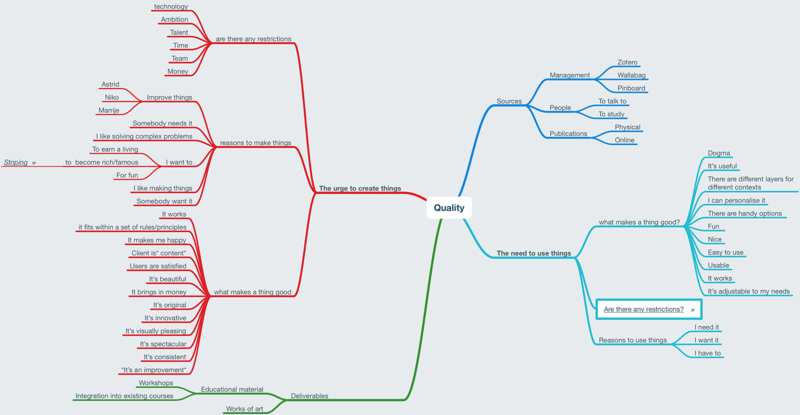 A visual mindmap of the different trails of my research. Here’s a link to an interactive version of this map, and here’s a link to the collapsable HTML outline of this map, the one that doesn’t really work. The map you see here is incomplete. I created a separate mindmap of the most complex part, the one about restrictions that people face when they have to use something.